The Illinois Bicycle Lawyers at Keating Law Offices devote a substantial part of their practice to representing victims of bicycle accidents. One of the first things the firm’s attorneys do when they are contacted by a client who was in a bicycle accident is to try and find out as much information as they can about the case. 1. Get Medical Attention: What may seem like an obvious thing, unfortunately often isn’t. Many bicyclists are strong willed, independent, tough people. This often leads to a mistaken belief that they can “shake off” an injury or will “heal on their own.” This isn’t always the case, and there’s a reason doctors go to medical school. Seemingly small injuries from a bicycle accident may be much worse than they appear. When in doubt, call an ambulance or go to the ER and get checked out. Remember that your well being is more important than anything else. 2. Contact the Police: Call 911 if necessary and complete a police report at the scene or the police station. 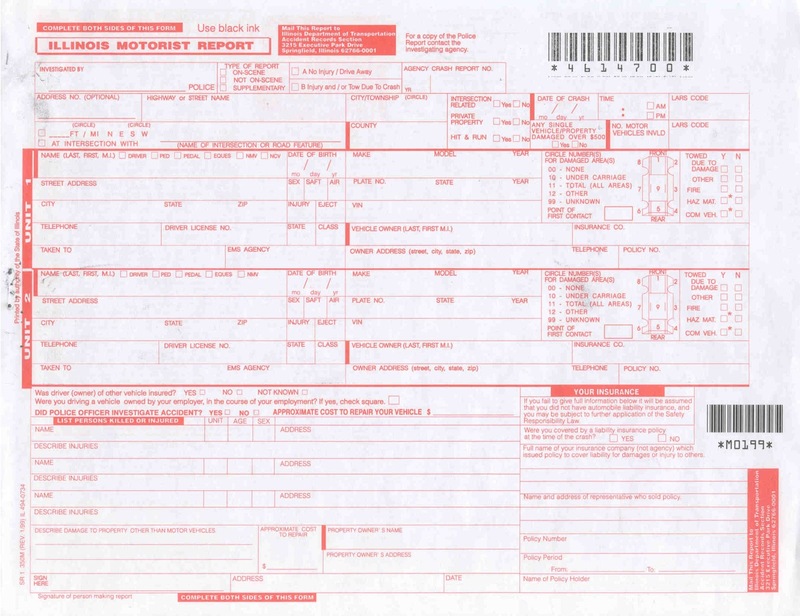 In Illinois the police will usually give you an “Illinois Motorist Report.” It is a white piece of paper with red ink (a picture of one is at the top-left of this post). 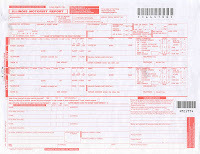 Even thought a bicycle is obviously not motorized, this is the document that is routinely used involving any vehicle collision or crash. Follow the instructions on the document and complete it as best you can. The police report is often a critical piece of evidence in a civil action stemming from a bike accident. Contact the Illinois Bicycle Lawyers at Keating Law Offices if you have any questions about this process. 3. Collect Information: Get the name, address, phone number and license plate of the driver as well as the names and phone numbers of any witnesses to the bike accident. Be aware that in Chicago many drivers can be tricky and know to give fake names and bad phone numbers. So get as much information as possible. 4. Collect Evidence: Get digital pictures of the scene, your bike, the license plate on your car and your injuries. In this day and age of cell phones equipped with very good digital cameras there is no reason not to substantially photograph as much evidence as possible. Also keep a record of the medical treatment you received and your medical recovery. A good idea is to get a large envelope or folder and throw all your medical information in there. That way you’ll know where the medical documents are when you need them. 5. Get Legal Advice: Keating Law Offices provides free initial consultations with no obligation. In some instances the firm will even provide a case investigation of the bicycle accident at no cost to the client at the onset of the case. Many cases can be resolved without going to court. It is important that you pursue your rights under the law. There are never any legal fees owed to Keating Law Offices unless the firm successfully resolves the case through settlement or trial. 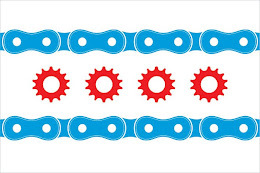 If you have any questions regarding this post, a bicycle accident, or an issue involving Illinois personal injury law, please contact Illinois Bicycle Attorney Mike Keating at 312-208-7702 or MKeating@KeatingLegal.com 24 hours a day, 7 days a week. All e-mails and phone calls are returned promptly. All initial consultations are confidential and free.